This painting is an interpretation of various sculptural reliefs found in the funerary temple of Queen Hatshepsut (18th Dynasty, 1473-1458 BCE) in Deir El-Bahri. Among other subjects, these reliefs depict a particular trade mission that took place during Hatshepsut's reign. 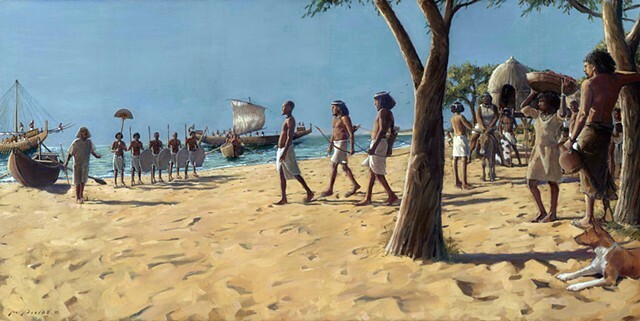 The expedition to Punt (a mysterious civilization on the Red Sea, approximately where Ethiopia exists today) was a massive undertaking for the Egyptians. Cargo boats had to be carried in pieces across the eastern desert, and then assembled for a sea journey that continued for hundreds of miles. The entire process took years and was fraught with terrible dangers. As one historian put it, the journey to Punt for the Ancient Egyptians could have very well been like "a journey to the moon" for us. Since Punt was not readily accessible yet yielded various exotic and much treasured goods from Africa and elsewhere, the city-state or whatever one may call it, assumed a kind of mythical presence throughout the history of Ancient Egypt. Punt was considered, in the words of the Ancient Egyptians themselves, "God's Land". Trade missions to Punt were difficult and infrequent, but were a critical aspect of Egyptian diplomacy. They also did much to contribute to the material wealth and resources of Egypt. Amongst the goods acquired during the mission in question were myrrh trees that were re-planted on Egyptian soil, providing for the first time in Egyptian history, a direct means of creating incense. unease, perhaps mistrust. The trade will be quite one-sided, but Punt realizes the necessity of appeasing the powerful Egyptian kingdom. The sculptural reliefs in the temple at Deir El-Bahri are exceptional in narrative detail and rich in historical information. There are even hints of what may be interpreted as humor, something that was quite uncommon in the generally austere orientation of pharonic, or state sponsored art. The overall result is a series of views that contain a particular realism that, for lack of a better metaphor, almost act as an ancient newsreel. Notwithstanding whatever propagandistic aims that may have been originally intended by these reliefs, I have determined to regard the information as is. Untold hours and labor forces were committed to creating these sacred walls. And I'm sure they reflect a substantial amount of truth, as pertaining to actual events as they occurred and actual people as they appeared.